But before the announcement – here’s an interesting aside about the history of stickers. Stickers originated in Japan in 2011 when a Korean Internet company called Naver began developing a chat app called Line. Due to the Tohoku earthquake and tsunami of 2011, many of the country’s telecom networks were strained and the company’s data-based calls and text messages worked better than regular calls and text messages. In early 2012, the app and the profile of the characters featured in Line’s sticker collections grew quickly. Stickers were born. Another interesting note? 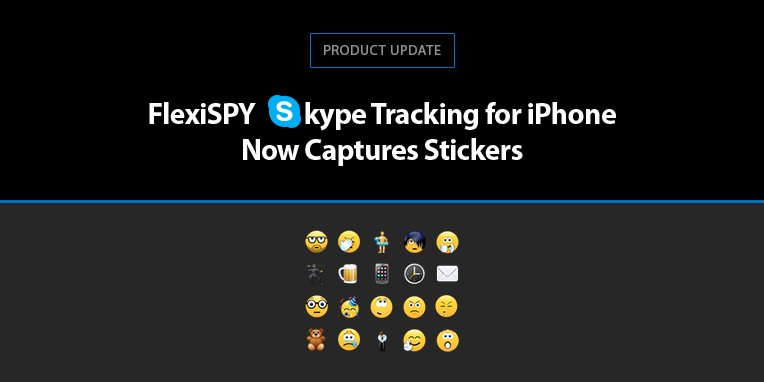 FlexiSPY captures stickers, and other important details of a conversation that competitor’s cannot — and that’s why we’re excited to announce we’ve brought this unique ability to Skype for iPhone with our latest update, Simply put, this means our iPhone monitoring software users now have even more meaningful context with their captured conversations. To get this enhancement to FlexiSPY for iPhone, check that the latest version of FlexiSPY is installed on the phone you’re monitoring. You can do this by going to the device info page inside your portal, then under product information > product version, look for a green link that says software update available. If you don’t see this, you’re running the latest version of FlexiSPY and there’s probably captured conversations with stickers waiting to be read. Simply click on the data tab, then im’s to start reading and getting insights. If you have a suggestion for a way we could improve FlexiSPY to make it more useful to you, and the rest of our customers, drop us your thoughts in the comments section below.